You will be able to use Google Analytics to track your visitors. Find which of your pages are performing the best. While you can see which devices bring in the most conversations. 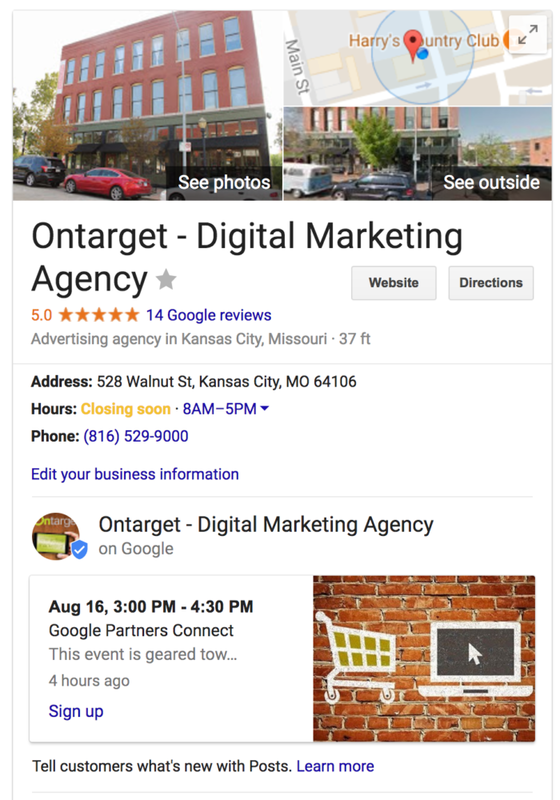 If you question what a Kansas City digital marketing agency does, this guide will help you cover your bases. I’ll let you in on a secret first: We do a LOT of Google set-up at first! This checklist will help you complete some of these Google marketing tasks yourself. Let’s begin! To set up your account, the first thing you’ll need to do is create a property in Google Analytics (one property for each website you’re tracking). This step will allow you to set your device tracking, industry category and reporting time zone. Then, you can set up the tracking code which allows the collecting of data you want. Creating a property will automatically generate a tracking ID which I then used in your gtag.js tracking code snippet. For Analytics help, you can visit the Google Analytics Academy. This online education center uses video, text and interactive features. In order to walk you through the set-up process and help you achieve certification. We recommend shooting for the certificate if you’re going to be using Analytics often (or if you’re a Kansas City digital marketing agency). The certification lasts for a year, the information is useful to anyone wanting to track their site performance, and you can use this certification to aid other businesses. You can use Google Analytics to track your visitors. Find which of your pages are performing the best. While you can see which devices bring in the most conversations. If you have certain analytics data or graphs that you want to group together and view on a single screen, you can create dashboards to view different widgets at a glance (see below). Advanced segments let you see which online marketing campaigns (ie: local search or social media) are bringing in conversions. That way, you can adjust your time and budget investment accordingly. Advertising on other platforms, like Google or Facebook, means choosing specific areas to target. If you aren’t sure which geographic areas are bringing in the most revenue for your business, you can use Analytics to see the location demographics of your visitors. This tab will tell you worldwide stats, like average time on site and bounce rate of visitors from specific countries. You can also use Analytics to determine your worst and best performing pages, see where people abandon the shopping cart, and view the percentage of total visits that come from a mobile device. Previously known as Google Webmaster Tools, Google Search Console is a free service that helps you monitor and maintain your site’s presence in Google Search results. Users don’t need to sign up for the Google Console. Their site will be indexed that happens anyways. The program only helps the user see how your site is viewed by Google. You can use it to make sure Google can access your content, submit new content for crawling (speeds up indexing), remove content you don’t want shown in search results, and monitor/resolve malware or spam issues. The service also lets you know what sites are linking to your site (backlinks), which queries cause your site to appear in search results and which products are highlighted in rich search results. Plus, it’s a platform for Google to communicate with you in the instance that something goes wrong with your site (i.e. : crawling errors, increase in 404 pages, etc.). Your Search Console account can be verified through your Google Analytics account, and information can even be shared between the two. You can use this great guide from Search Engine Watch for set-up steps and a more thorough breakdown of Search Console features. The first thing you’ll need to do when setting up a Google My Business account is add or claim your business. Next, verify your business listing to ensure legitimacy. You can verify businesses via email, postcard, or phone depending on your business. Instant verification is available if you’ve already verified your business’s website with Google Search Console. Once verified, your listing will show up in Maps, Search and other Google services. When you manage 10 or more locations, uploads and edits can be made in bulk. Keeping your Google My Business information up-to-date prevents people from showing up to your location when you’re not actually open, verifies that you’re a tech-savvy business, and provides imperative business information if you don’t have a website. If your hours are going to be different for the holidays. or you’re going to be out of town on vacation, this information needs to be reflected in your hours. Adding photos also improves the legitimacy of your business and makes it easy for people to identify your storefront if they’re visiting a physical location. You’ll be able to list your attributes, URLs, hours, category, phone number, and more. Attributes can include anything from your gender (if for a doctor listing), whether your location offers Wi-Fi, if you have outdoor seating, and if your business is wheelchair accessible. If you move locations, you NEED to make updates on your GMB listing. More likely than not, you’ll also need to make changes to all the other local directories that might have your previous address on record. This new feature allows you to share time-relevant promotions, events and articles. You’re able to upload an image, throw in 300 words of text, add an event title, start and end date with times, and a call-to-action button saying ‘learn more’, ‘sign up’, etc. It’s also a great way to highlight new arrivals and best-sellers. It can be used to give visitors a one-click gateway to make a reservation or sign-up for a newsletter—all from the search engine results page. Keep in mind though that they expire in seven days, so you’ll need to update them regularly. Best practices include uploading images that are the ideal 750 by 750 pixels and creating a custom URL to use in the call-to-action link. These custom URLs allow you to track whether users converted after visiting your site from the post button. Setting up messaging gives users a way to ask questions about your business without making a phone call. Their messages are sent via text to whatever number you have set up. You can include a couple introductory sentences for autoreply if you want to make sure your response rate is stellar. We would recommend something like: ‘Hey! We provide _____ services. How can we help you?’. You can set up messaging by clicking ‘Messaging’ on the left. You can download Allo for messaging as well. An average response time will be generated to let users know how quickly they can expect a reply (this time can be seen on the ‘messaging’ card in the home menu). This stat plays a role in your reputation management for Kansas City digital marketing; businesses with low response rates will deter customers. Reviews are becoming more and more essential to a consumer’s purchasing decisions, so it’s important to have a good amount of Google reviews from trusted sources (like Local Guides). Anonymous reviews cannot be added. The reviews left have added legitimacy. If you have a dispute with one of the reviews written about your company (ie: if it’s a disgruntled employee or competitor), you can contact Google to get the review removed. Be sure to reply to your reviews to show visitors that you care about your brand’s perception. Encourage customers to leave a review via email, but refrain from offering incentives. This can be construed as bribing and land you in a lot of trouble with review platforms. Also, keep in mind that 95% of consumers suspect censorship or faked reviews when they don’t see bad scores. If you’re a Kansas City digital marketing agency, you want to veer your clients away from review censorship. We recommend using a URL shortener like bitly to make things look a little neater before you share with customers! Kansas City digital marketing is the name of our game, so let us know if you’d like to get started on your own internet marketing campaign!